On Sunday, November 11 the Chico branch library will be closed in observance of Veteran’s Day. On Wednesday, November 21 (Thanksgiving Eve) the library will close at 5 p.m.
On Thursday and Friday, November 22 and 23, the library will be closed for Thanksgiving. The library will be open on Sunday, November 24 from 1 p.m. to 5 p.m., as usual. The members-only sale for November takes place on Friday, November 2 from 2:00 p.m. to 4:00 p.m. in the library’s meeting room. The regular sale open to the general public continues on Saturday morning, 9:00 a.m. to 11:30 a.m.
All items will be half price during the book sales on Friday, November 2 and Saturday, November 3. With CFOL’s low prices, shoppers won’t be able to resist the many bargains of books, magazines, media, and other items. Beginning after Thanksgiving and during the month of December, library friends and patrons will have an opportunity to add to the library’s collection. Books selected by library staff will be on display near the library entrance. Friends and patrons may choose one or more items to purchase and donate to the library. Exercise your holiday spirit of generosity while enriching your library’s holdings! 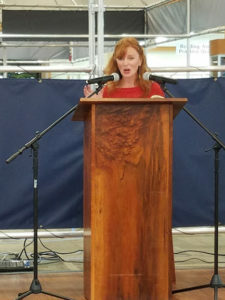 Award-winning author Apricot Irving read excerpts from and discussed her memoir, The Gospel of Trees, to a rapt audience. 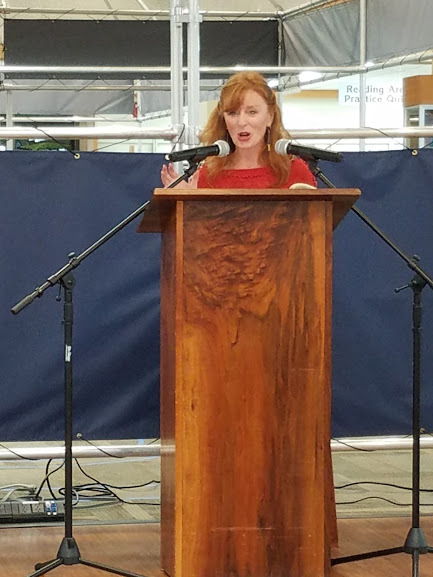 This work chronicled her family’s several sojourns in Haiti, beginning when Apricot was 6 years old, as her father endeavored to aid in reforestation of the island. The stresses on the family as well as the few successes and many failures of missionary efforts are set within the context of Haiti’s history and culture. The Gospel of Trees is available from the library. On Friday, December 7 at 4:00 p.m. your CFOL will sponsor a performance by the local holiday band, the Yule Logs. Past performances by this popular group have drawn standing-room-only audiences, so be sure to attend this entertaining program.